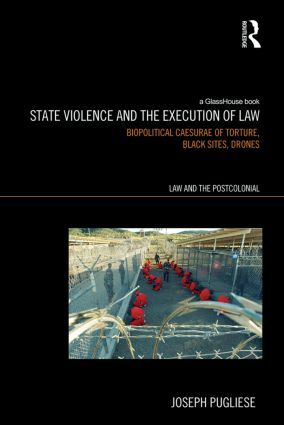 State Violence and the Execution of Law stages a provocative analysis of how the biopolitical divide between human and animal has played a fundamental role in enabling state violence, including torture, secret imprisonment and killing-at-a-distance via drones. Analyzing the complex ways in which the United States government deploys law in order to consolidate and further imperial relations of power, Pugliese tracks the networks that enable the diffusion and normalization of the state’s monopoly of violence both in the US and in an international context. He demonstrates how networks of state violence are embedded within key legal institutions, military apparatuses, civilian sites, corporations, carceral architectures, and advanced technologies. The author argues that the exercise of state violence, as unleashed by the war on terror, has enmeshed the subjects of the Global South within institutional and discursive structures that position them as non-human animals that can be tortured, killed and disappeared with impunity. Drawing on poststructuralist, critical race and whiteness, and critical legal theories, the book is transdisciplinary in its approach and value. It will be invaluable to university students and scholars in Critical Legal and Socio-Legal Studies, Cultural Studies, Race and Ethnicity Studies, International Politics, and Postcolonial Studies. Joseph Pugliese is an Associate Professor of Cultural Studies at Macquarie University, Sydney. Recent publications include the edited collection Transmediterranean: Diasporas, Histories, Geopolitical Spaces and the monograph Biometrics: Bodies, Technologies, Biopolitics which was short-listed for the Surveillance Studies Book Prize 2010.